4-5 Arlington is located on the west side of Arlington, between Beacon and Marlborough, with 3 Arlington to the north, across Alley 421, and 6 Arlington (0 Marlborough) to the south. 4-5 Arlington were built in 1860-1861, two of four houses (4-5-6-7 Arlington) built at the same time. Click here for indices to the deeds for 4 Arlington and 5 Arlington. The land on which 4-5-6-7 Arlington were built was originally part of a larger tract purchased from the Commonwealth of Massachusetts on September 2, 1858, by George Goss and Norman Carmine Munson, who were the contractors responsible for filling the Commonwealth’s Back Bay lands. On the same day as they purchased the land, Goss and Munson sold it to a consortium of Peleg W. Chandler, J. Amory Davis, and Henry Lee, Jr. They, in turn, divided the land on Arlington into four lots. In April of 1860, they sold the lot at 7 Arlington to William Richards Lawrence, and in May of 1860, they sold the lot at 4 Arlington to Henry Atkins. On May 17, 1860, Chandler, Davis, and Lee entered into an agreement with William Carpenter, a carpenter, and Horace Jenkins, a mason, to build houses at 5 and 6 Arlington. On May 18, 1860, William Lawrence and Henry Atkins entered into a separate agreement with Carpenter and Jenkins governing the design and construction of all four houses to be built (the agreement does not specify that the houses at 4 and 7 Arlington would be built by Carpenter and Jenkins, and they may have been built by someone else). On September 26, 1860, Seth Simmons, a carpenter builder, bought the lot at 5 Arlington and he may have taken charge of building the house there. The original owners wanted to ensure that their new homes would be harmonious in design, both with each other and with the other houses being built nearby. The property already was subject to extensive restrictions contained in the deeds from the Commonwealth, but the owners added further stipulations in their May 1860 agreements, among them that “the front of said houses shall be of free stone and the height not less than three stories” and “the top of the cornice of main houses shall be fifty four feet high above sidewalk in Arlington Street, or as high as that of Geo. O. Hovey’s house Number 100 Beacon Street” and “the cornice and roof of all the houses shall be uniform, and shall conform to a plan to be hereinafter agreed upon.” 4-5-6-7 Arlington were being built contemporaneously with the other houses on Arlington, and 100 Beacon was the closest completed house that could serve as a model of design. 4-5-6-7 Arlington were completed in mid-1861. Consistent with the agreements among the owners, were designed as a single symmetrical composition, with the two middle houses (5-6 Arlington) set slightly further back from the street than the two end houses (4 Arlington and 7 Arlington). The design complemented similar pavilion-style French Academic designs at 1-2-3 Arlington and 8-9-10-11 Arlington. As originally built, there was a four foot wide passageway at the rear of 4, 5, and 6 Arlington, running parallel with Arlington, to provide access to the alley for all four houses. The facades of 4-5 Arlington have been significantly remodeled (in 1925-1926, when the two buildings were combined, and again in 1993-1994) and the mansard roofs removed, and 6-7 Arlington were demolished in 1929 and replaced with a ten-story apartment building and clubrooms for the Junior League. 4 Arlington was built in 1860-1861 as the home of Henry Atkins, a grocer and importer of wines and spirits, and his wife, Elizabeth Cummings (Gay) Atkins. He purchased the land for the house on May 17, 1860. They previously had lived at 10 Bedford. Henry Atkins died in December of 1870, and Elizabeth Atkins died in July of 1872. The heirs of H. Atkins are shown as the owners on the 1874 Hopkins map. 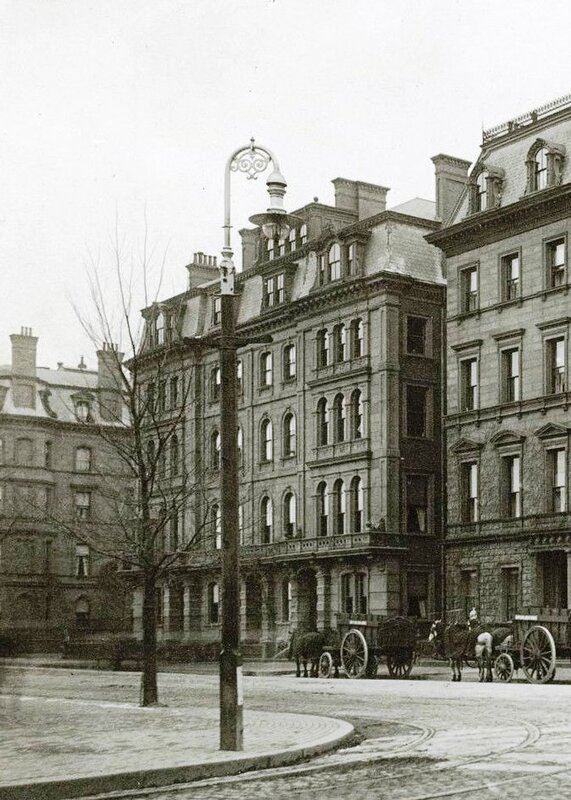 Their unmarried son, Henry H. Atkins, a wine importer, continued to live at 4 Arlington during the 1876-1877 winter season, but moved soon thereafter the Hotel Vendome. 4 Arlington remained in the Atkins family. Henry Atkins’s heirs et al are shown as the owners on the 1883, 1888, and 1898 Bromley maps and were the assessed owners through 1906, and Henry and Elizabeth Atkins’s son, John Eliot Atkins et al, trustees, are shown as the owners on the 1908 map and were the assessed owners through 1910. John Eliot Atkins, who lived in New York City, died in March of 1908. His estate and his father’s estate continued to own 4 Arlington until 1925. During the 1877-1878 winter season, 4 Arlington was the home of John Evart De Witt and his wife, Naomi (Hawley) De Witt. They also maintained a home in Portland, Maine. He was president of the Union Mutual Life Insurance Company of Maine. The De Witts moved to 290 Marlborough by 1879. 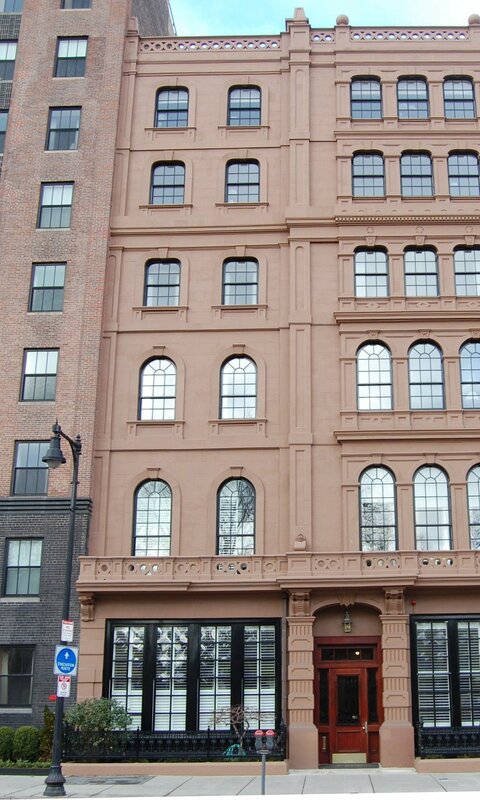 4 Arlington was not listed in the 1879-1882 Blue Books. 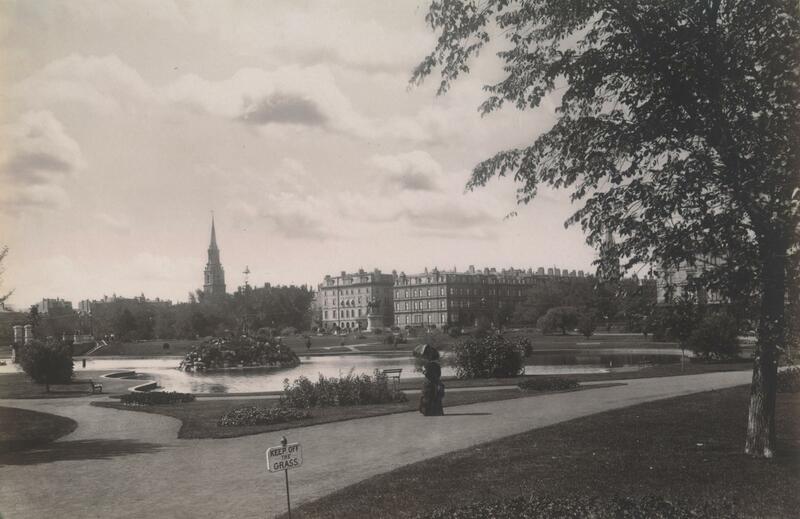 By the 1882-1883 winter season, it was the home of John Smith Allan and his wife Adelaide Stuart (Gault) Allan. They previously had lived at 57 Beacon. He was head of the Boston offices of the Allan Steamship Line, a Canadian and Scottish firm founded by his father, Andrew Allan, and his uncle, Sir Hugh Allan. They continued to live there in 1885, joined by his brother and sister-in-law, Hugh Andrew Allan and Margaret (Rae) Allan. Hugh and Margaret Allan had married in 1884 and probably came to Boston from Montreal soon thereafter. 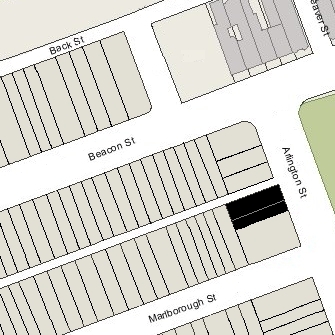 By 1886, John and Adelaide Allan had moved to 276 Beacon. Hugh and Margaret Allan were shown in the 1887 and 1888 City Directories as living in Montreal, but by 1889 were listed in the Blue Book at 231 Beacon. By 1888, 4 Arlington had been converted into a lodging house and retail store. From about 1888 through about 1895, it was the location of Doe, Hunnewell, and Company, a furniture company owned by Elias Hunnewell. From about 1896 through about 1903, it was a dressmaker’s shop operated by John C. S. Parcher. The house was not listed in the 1905-1909 Blue Books. In about 1908, 4 Arlington became McClintock’s School for Girls, operated by Miss Mary Law McClintock. A native of Newberry County, South Carolina, she had served as head of the Department of English at the University of Florida from 1896 to 1901, and later as a principal of Mount Ida College in Newton. The school continued to be located at 4 Arlington (with an additional location at 135 Beacon by 1922) until her death in January of 1925. On June 1, 1925, real estate dealer Edward J. Ball purchased 4 Arlington. The sellers were William W. and Samuel Vaughn, trustees under the will of Henry Atkins; John B. Folger and J. Henry Russell, trustees under the will of John E. Atkins; Massachusetts General Hospital; and Children’s Hospital (the hospitals being residual beneficiaries under John E. Atkins’s will). On June 30, 1925, 4 Arlington was acquired from Edward Ball by Harry Francis Estabrook. He had owned 5 Arlington since 1916 and operated an Oriental rug shop at that location. He subsequently combined the buildings with the address of 5 Arlington. 5 Arlington was built in 1860-1861 on a lot purchased on September 28, 1860, by Seth Simmons. He was a carpenter and builder, and probably built the house (although it may have been built by William Carpenter and Horace Dexter, with whom the former owners of the land — Peleg W. Chandler, J. Amory Davis, and Henry Lee, Jr. — previously had contracted to build houses at 5 and 6 Arlington). Seth Simmons and his wife, Betsey G. (Miller) Simmons, lived in Brighton. On March 1, 1862, John Chandler, a dry goods merchant, purchased 5 Arlington from Seth Simmons. He and his wife, Anna (Perkins) Chandler, were the first residents of the house. They previously had lived at the Revere House hotel. John Chandler died in November of 1875 and Anna Chandler died in May of 1876. On August 8, 1876, Patrick Jackson and Nathan Chandler, the guardians of John and Anna Chandler’s minor children, John and Anna Chandler, sold 5 Arlington at public auction to Harriett Ann (Allen) Porter, the wife of Dr. Charles Burnham Porter. 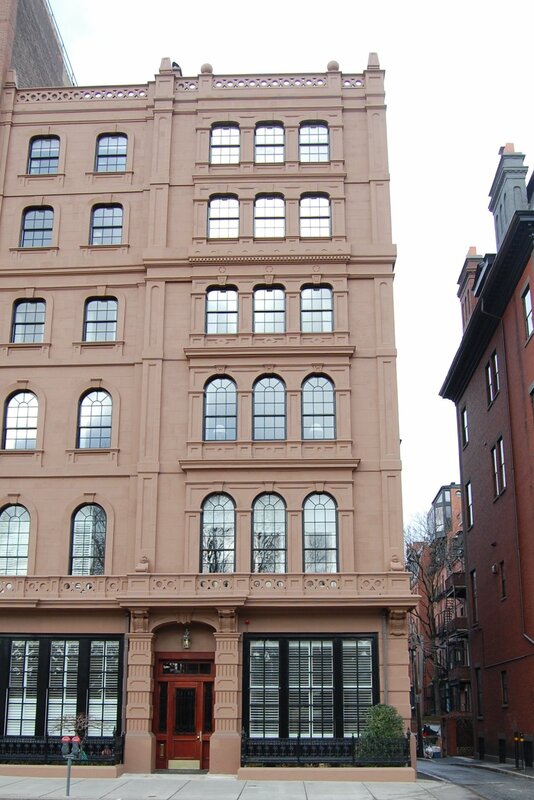 They previously had lived at 103 Boylston. Charles Porter was a physician and surgeon. He served as a demonstrator in anatomy at Harvard Medical School under Dr. Oliver Wendell Holmes, and later was professor of clinical surgery at Harvard. Charles Porter died in May of 1909. Harriett Porter continued to live at 5 Arlington, joined in about 1913 by her daughter, Edith, the wife of Dr. Percy Musgrave (who was a physician in the army). In about 1915, they moved to 209 Bay State Road. On October 13, 1915, Harriett Porter sold 5 Arlington to real estate dealer William J. Stober, who transferred it five days later to attorney and real estate trustee Leslie Clark Wead. He and his wife, Kate Haswell (Whitcomb) Wead, lived at 3 Fairfield. On July 27, 1916, Harry Francis Estabrook purchased 5 Arlington. He was a dealer in Oriental rugs, doing business as Richard Smart Oriental Rug Works. In August of 1916, he filed for (and subsequently received) permission to remodel the house into a store on the street level and apartments above, including installing a new store front. The remodeling was designed by architect Frederick Whitcomb Wead, the son of Leslie and Kate Wead, who lived with his parents at 3 Fairfield. Plans for the remodeling are included in the City of Boston Blueprints Collection in the Boston Public Library’s Arts Department (reference BIN H-33). In June of 1925, Harry Estabrook had acquired 4 Arlington, and in July of 1925, he filed applications to combine and significantly remodel both buildings, with the principal address being 5 Arlington. The permits were initially denied by the Building Department and his appeal was rejected by the Board of Appeal. However, in October of 1925, the Board of Appeal reconsidered and granted the petition. 4-5 Arlington (ca. 1949), courtesy of the Bostonian Society. As a part of this remodeling the entrances to the two buildings were consolidated into one entrance with the combined building having the address of 5 Arlington. The remodeling was designed by architect George Nelson Meserve. Plans for the remodeling — including elevations and floor plans — are included in the City of Boston Blueprints Collection in the Boston Public Pbrary’s Arts Department (reference BIN N-9). 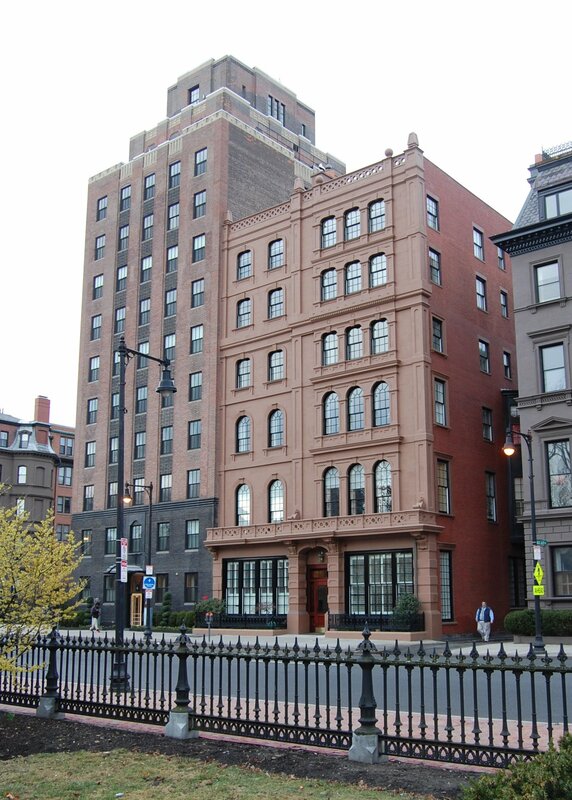 Harry Estabrook remained the owner of 4-5 Arlington and in the fall of 1931, the Institution for Savings in Roxbury and Its Vicinity foreclosed on its August 24, 1925, mortgage to him. On November 19, 1931, it offered the property for sale at public auction and subsequently took possession of the property. In July of 1932, the bank applied for permission to change the occupancy to allow a restaurant to be located in the former space used for retail, noting that the space was currently vacant but was “formerly a gift shop and prior to that a shop for the sale and repairing of rugs.” The application was subsequently abandoned. On February 1, 1935, 4-5 Arlington was acquired by Alfred W.Douglass and Carleton Hunneman, trustees of the Limechest Real Estate Trust. They continued to own the property until January of 1946, when it once again became the property of the Institution for Savings in Roxbury. 4-5 Arlington continued to be occupied by retail space on the ground level and apartments above. By the early 1940s, the store space was occupied by Traynor’s Florist. It closed in about 1947. On January 4, 1946, 4-5 Arlington was acquired by Carleton Hunneman, Edward L. Francis, Robert Livermore, Jr., and Edward E. Wendell as trustees of The Five Trust. 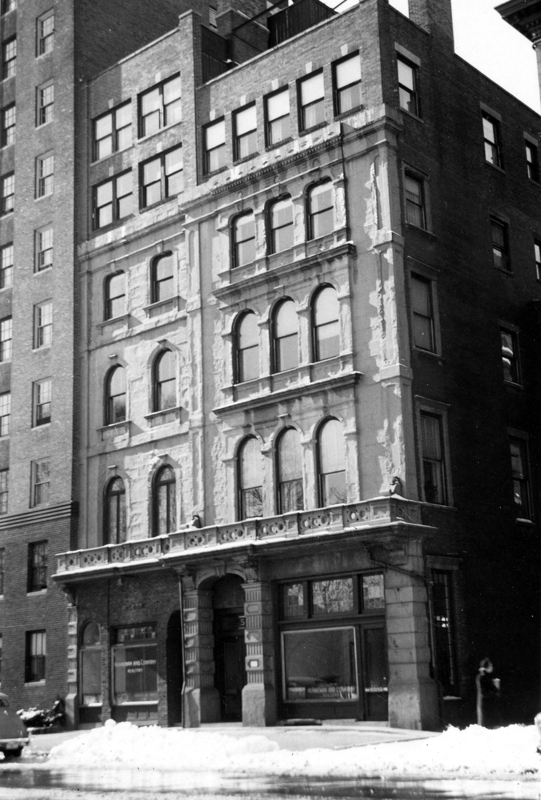 In June of 1955, The Five Trust applied for (and subsequently received) permission to change the occupancy from an office and store on the first floor and 13 apartments above, to an office and beauty shop on the first floor, and thirteen apartments above. Real estate brokers Hunneman and Company occupied the office; “Frank and Henri Coiffures” were proposed as occupants of the former retail space. On May 31, 1962, The Five Trust transferred 4-5 Arlington to the Katharine Gibbs Realty Trust. Gordon Gibbs, Blanche L. Gibbs, and Edward L. Kane were the trustees of both trusts. In July of 1962, Katharine Gibbs School, which already owned and occupied 6 Arlington next door, converted 4-5 Arlington into a dormitory, with doors cut through to 6 Arlington on several levels. In 1968, Katharine Gibbs School was purchased by Macmillan Inc. 4-5-6 Arlington remained the property of the Katharine Gibbs Realty Trust. In February of 1988, the Trust sold 6 Arlington to Emerson College. The Trust retained 4-5 Arlington. In May of 1989, Macmillan Inc. announced plans to sell Katharine Gibbs School. The school subsequently was purchased by Phillips Colleges. Probably in anticipation of (or as a part of) the sale, on June 29, 1989, the Katharine Gibbs Realty Trust transferred 4-5 Arlington to Macmillan Inc. At the same time, it also transferred its ownership of several other properties, including 21 Marlborough, 23 Marlborough, and 86 Beacon. On September 29, 1993, Macmillan Inc. sold 4-5 Arlington and 86 Beacon to Beacon-Arlington LP. Beacon-Arlington LP converted 4-5 Arlington into seven apartments, including significantly remodeling them to add a floor to 4 Arlington (thereby making the two buildings the same height) and installing a new façade and fenestration more consistent with the historical nature of the building. 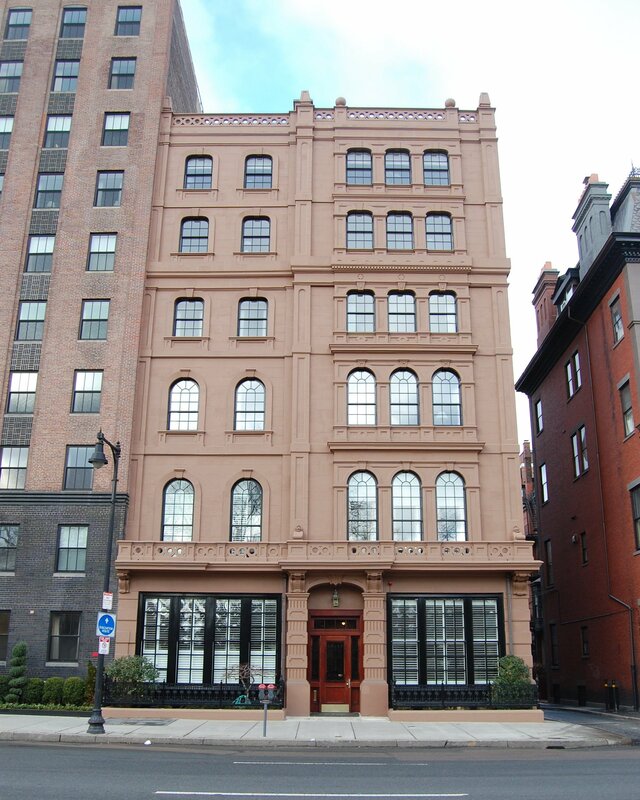 On July 29, 1994, Beacon-Arlington LP sold 4-5 Arlington to Robert F. Oberkoetter, trustee of the 4-5 Arlington Street Trust, and on 15, 1995, he converted the apartments into seven condominium units, the 4-5 Arlington Street Condominium.